3M-Matic(TM) Random Case Sealer 7000r3 Pro is a random case sealer that automatically adjusts for case height and width and is capable of sealing 19 boxes per minute, using tape widths from 48mm to 72mm wide. Fast and Flexible Productivity 3M-Matic™ Random Case Sealer 7000r3 Pro With 3" 3M™ AccuGlide™ 3 Taping Head is a sealing machine for random size carton sealing designed to automatically adjust to a variety of box sizes. This packaging sealer uses 2-3” (48-72mm) tape to seal up to 24 different case sizes per minute: case lengths of 6” (150mm) or more, widths of 6.5-26.5” (165-673mm) and heights of 2.25-26” (57-660mm) in standard position (heights of 11.75-36” (299-915mm) in high mast position). Photo eye detection quickly responds to different case widths while the electro-mechanical height adjustment delivers precision performance. 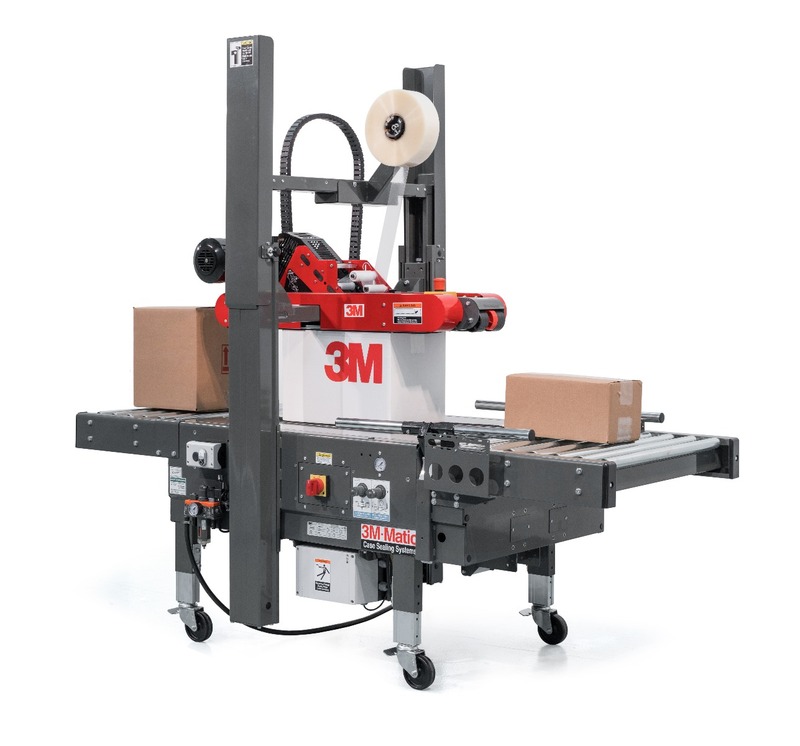 The auxiliary offset taping head position provides the carton sealer with flexibility for shorter boxes while the 3M™ AccuGlide™ 3 Taping Head offers low impact sealing to protect cases during the sealing process. Recommended Applications Many industries can benefit from the features of the 3M-Matic™ Random Case Sealer 7000r3 Pro With 3" 3M™ AccuGlide™ 3 Taping Head, including: Food and beverage Medical devices Pharmaceutical Electronics Manufacturing and distribution centers Consistent, Reliable, Tough The top and bottom belt drives on 3M-Matic™ Random Case Sealer 7000r3 Pro With 3" 3M™ AccuGlide™ 3 Taping Head securely move the carton through the sealer without skewing or tipping the box, which is particularly useful for tall cartons that aren’t very long. Additionally, this case sealer comes with a centrally located emergency stop and dual masts. Bringing Better Ideas to the Surface through Science and Innovation 3M Industrial Adhesives and Tapes Division applies the science of adhesion to deliver innovative solutions that improve the design and manufacturing processes of companies around the world. In the end, these technologies help customers deliver competitive products to the market faster and more efficiently.